Before the war automotive pioneer karl benz left the firm that bore his name in 1906, when hans nibel became the chief designer. Under nibel, who also drove its racing cars, benz became a leader in international competition. Benz road cars ranged from the two-litre 820 ps to the ten-litre 39100. sporty touring car the 2770 was a deluxe automobile on a spacious 12-ft. Wheelbase. The bodystyles most in demand were the limousine and torpedo touring car, torpedo being the name given for an open car with an unbroken line from the hood to the rear. This model, with its v-shaped radiator and windshield, folding top, and exhausts and levers on the outside, had a sporting allure. 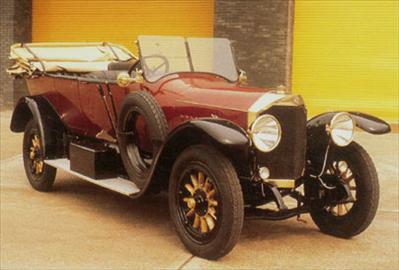 It was, however, too heavy to be speedy even though it was equipped with a seven-litre engine. Sales were modest because germany was passing through an extremely difficult period economically. This luxurious benz 2770 ps torpedo was a big and heavy touring car with a sporty appearance.